Holy Monday Bridegroom Service - This service features readings and hymns related to the Parable of the Ten Virgins, 5 of whom were prepared with adequate oil and were permitted to join the bridegroom at the wedding feast, while the others were unprepared and cast into the darkness. Holy Tuesday, featuring the Hymn of Kassiani - The hymns and readings of this service focus on the actions of 2 characters during Christ's final days: the sinful woman who anointed his feet and Judas, who would eventually betray him. The high point of this service is the stirring Hymn of Kassiani, which highlights the woman's humble repentance, contrasting it with Judas' betrayal. Holy Unction - The primary theme of Holy Wednesday is our human need for the healing and forgiveness that comes into our lives when we establish a relationship with God through Jesus Christ. We are reminded that the way to this relationship is to be found, above all else, through the life of prayer. In the Mystery of Holy Unction, the faithful are anointed and thus, healed both physically and spiritually. We are reconciled to God and one another so that we might receive the gift of the Holy Eucharist instituted by Christ at the Last Supper. Apokathelosis (Αποκαθελωσις; Descent from the Cross) - As the priest proclaims the Gospel, "And Joseph took the body, and wrapped it in a clean linen shroud, and laid it in his own new tomb..." he removes the Body of Christ from the Cross, wraps it in a new white cloth and takes it to the altar. 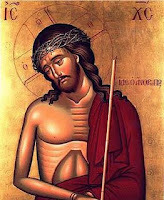 The priest then chants the hymn: " When Joseph of Arimathea took You, the Life of all, now dead, down from the Cross, he buried You in fine linen, after anointing You with myrrh. He yearned with desire, humbly contained by awe, rejoicing, he cried out to You: Glory to Your condescension, O merciful God!" The children of the church then carry the Epitaphios (the cloth on which the Body of Christ is painted or embroidered) around the church before the priest places it inside the Sepulcher, a carved bier which symbolizes the Tomb of Christ. The Lamentations - On the evening of Holy Friday we sing hymns of lamentation, mourning Christ's death as we carry the bier with the icon of Christ's body around the outside of the church building in a funeral procession. At the end of the service, the bier is raised overhead and the faithful re-enter the church by passing underneath it, a symbol of our identification with Christ's sacrificial death for our sins. The Resurrection Service - The Pascha service begins just before midnight on Saturday night/Sunday morning. We gather inside the church, which is pitch black, reminding us of the darkness of the tomb. At the stroke of midnight, the priest emerges from the sanctuary carrying the Pascha flame, which we pass from person to person until the church is full of the light of Christ's resurrection. 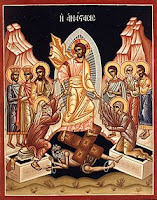 We once again process outside, this time chanting the triumphal Paschal Hymn, "O Christ is risen from the dead, and through death he did trample upon death, and thus bestowed upon those in the tombs the gift of eternal life."